The nowadays continuously increasing number of mobile users, devices and new mobile applications has resulted in the mobile data traffic growing at an unprecedented rate, which alternatively has a significant impact on the complexity of processes required to provide reliable cellular networks. Over the last few years, mobile operators are struggling to cope with these challenges. Still they rely on highly centralised and custom hardware components that are not designed with elasticity in mind, leading to a weak optimisation of resources during non-peak hours and frequent overloads during peak hours. A model was proposed for network performance, comparison the location of data centres in an LTE-A network with an implementation of a virtualised infrastructure, by separating base stations into Remote Radio Heads (RRHs) and Base Band Processing Units (BBUs). 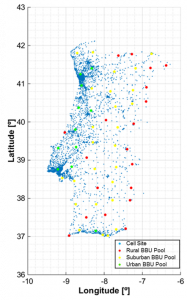 A Portugal countrywide network (cell site locations), with some thousands of base stations, was taken as application example. The number of BBU Pools required to support the set of cell sites positioned countrywide was analysed. It decreases with the maximum fronthaul delay increase, from 273 BBU Pools for 75 μs to 56 for 200 μs; a rational model fits very well this behaviour. The share of single site BBU Pools was assessed, the maximum pooling gains being achieved for 150 μs of maximum fronthaul delay. The maximum, minimum and average fronthaul delay and fronthaul distance evolution were examined, as well as their standard deviation; for both quantities, a linear increase in their average and standard deviation with the maximum fronthaul delay is observed, the average values being significantly below the imposed maximum constraint. The minimum fronthaul delay is zero in every case, due to the ever positive share of single site BBU Pools, and consequently this exact scenario translates into an always null minimum fronthaul distance. Regarding fronthaul distance, the spreading of cell sites along the BBU Pools coverage areas has quite an influence, where in rural areas the sites are more or less equally scattered, as opposed to urban areas, where sites tend to be more concentrated near the BBU Pool – for these purpose, BBU Pools were divided in three classes (Urban, Suburban and Rural) according to the number of sites within their coverage area. As usual, July is the month for one more gathering of GROW members, and their families, in Monsaraz, for one more STAR WARM (STill AnotheR Wonderful Annual Reunion in Monsaraz), this year on July 4th, for the 15th edition. Luisa Caeiro, Filipe D. Cardoso and Luis M. Correia, “OnDemand Radio Resource Allocation for Virtual Wireless Access”, Wireless Personal Communications, Vol. 82, No. 4, June 2015, pp. 2431-2456. Sina Khatibi and Luis M. Correia, “Modelling Virtual Radio Resource Management with Traffic Offloading Support”, Proc. of EuCNC’2015 – 24th European Conference on Networks and Communications, Paris, France, June 2015. Luisa Caeiro, Filipe D. Cardoso and Luis M. Correia, “Addressing Multiple Virtual Resources in the Same Geographical Area”, Proc. of EuCNC’2015 – 24th European Conference on Networks and Communications, Paris, France, June 2015. Carla Oliveira, Michal Mackowiak and Luis M. Correia, “Uplink Exposure Assessment of 3G/4G Wireless Devices”, accepted to Special Session on Low‐EMF Radio‐link Technologies and Wireless Networks Management, at ISWCS’2015 — International Symposium on Wireless Communication Systems, Brussels, Belgium, Aug. 2015. Luis M. Correia, “A Perspective on Virtual Radio Access Networks”, Proc. of 1st Oporto University Doctoral Congress in Engineering, Porto, Portugal, June 2015. Contributions to the section on “off-body” communications were sent. New simulations with the Google Glasses are being carried on, in WP2. A paper with a survey on low EMF exposure techniques and networks is being prepared to be submitted to IEEE Communications Surveys and Tutorials. Deliverable D5.2 is being finalised and will be delivered soon. The 10 finalists have been announced and they will present their project in the final ceremony to be held July 11th.